Live2Lead: Southern Illinois 2018 early bird tickets on sale NOW! 2018 Grad Spree a success! The Marion Chamber of Commerce has teamed up with AES Solar to offer Chamber members an exclusive opportunity to receive a 15% equipment discount. Click here to learn more. I’m sorry to inform everyone that Dalus Ben Avi has given the Chamber her Letter of Resignation effective Friday, July 6th. We wish her all the best in her new endeavor as Director of Marketing and Community Engagement for Centerstone. Here is the job description for the Executive Director position at the Marion Chamber of Commerce. If you are or know of someone who would be interested, please send your resume and cover letter to MarionChamberJanet@gmail.com. We are in the process of accepting resumes and finding a replacement. Please help me thank Dalus for the positive contributions she has made during her time with us. Dalus has helped us implement many new programs during her tenure. We have all benefited from her organizational skills. I invite you to join us next Thursday, July 5th starting at 4:30 for a “come and go” celebration at Pookie’s held in her honor. Please come out to wish Dalus well on her new position! The My Tax Illinois Workshop will be held on July 10, 12, 18 and 27 from 8:30-10:30 a.m. 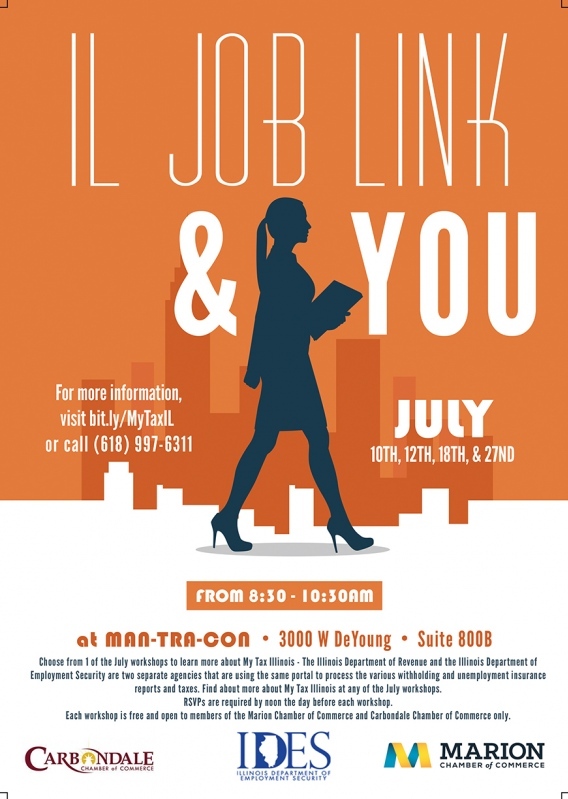 Choose from 1 of the July workshops to learn more about My Tax Illinois - The Illinois Department of Revenue and the Illinois Department of Employment Security are two separate agencies that are using the same portal to process the various withholding and unemployment insurance reports and taxes. Find about more about My Tax Illinois at any of the July workshops. RSVPs are required by noon the day before each workshop. 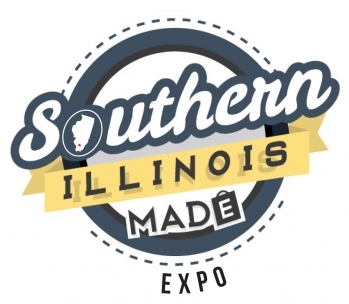 Each workshop is free and open to members of the Marion Chamber of Commerce and Carbondale Chamber of Commerce only. All workshops will be held from 8:30-10:30 a.m. at Man-Tra-Con, 3000 West DeYoung, Suite 800B, Marion. The Illinois Department of Employment Security has teamed up with the Marion Chamber of Commerce and the Carbondale Chamber of Commerce to put on a series of workshops to help you better understand and use their services. Participants in these workshops will be able to sign onto the IDES Web site and, if you wish, register for services. All workshops are free and are limited to members of either the Marion or Carbondale Chambers of Commerce. The workshops include: June - Illinois Job Link; July - My Tax Illinois; August - State Information Data Exchange System (SIDES). NOTE: RSVPs are now due by Friday, July 6 at noon! Registration is limited to the first 130 guests. 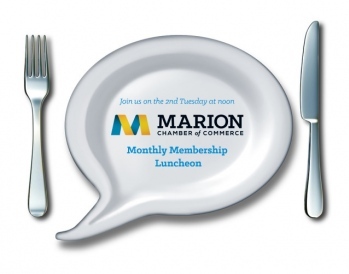 The Marion Chamber of Commerce Monthly Membership Luncheon will be held on Tuesday, July 10 at Celebrations Event Center. Lunch service begins at 11:45 a.m. The speaker will be Tom Logan with Marion Medical Mission. St. Nick's will be the caterer. The menu will include BBQ or chicken and dumplings, mixed salad, roll, cookie, tea & lemonade. HireLevel the sponsor of the July Monthly Membership Luncheon. Registration for the event is $12 (payable to the Marion Chamber of Commerce) to those who RSVP prior to noon on the FRIDAY before the luncheon. Pre-registration is strongly encouraged. After noon on the Monday before the luncheon, no more registrations will be taken, however walk-ins will be accepted. Please note that the walk-in rate is $15. If you register for an event and are unable to attend, a 24-hour notice is required or you will be invoiced. Note: If you have registered and are unable to attend, you may transfer to a fellow employee without penalty. A refund will only be given to those with a paid registration who cancel more than 24 hours prior to the event. If any Marion Chamber of Commerce member would like to have fliers for an upcoming event, announcements, etc. given to each attendee at the luncheon, please contact the Chamber at 618.997.6311 to arrange for delivery of the fliers prior to the luncheon. 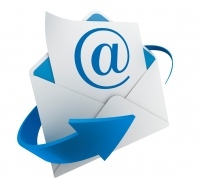 The deadline to supply fliers for the luncheon is noon on the Monday before the luncheon. 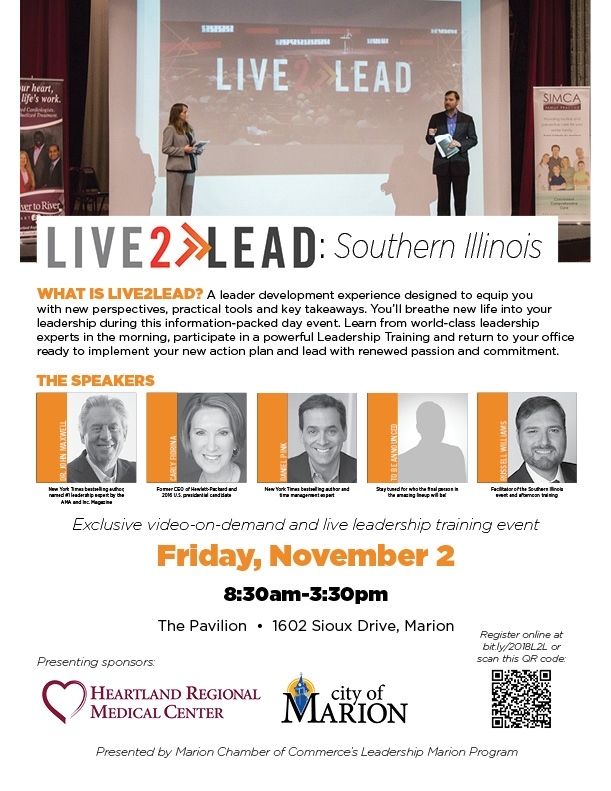 Live2Lead will be presented in Southern Illinois on Friday, November 2 at The Pavilion. The exclusive video-on-demand and live leadership training event will be hosted by Marion Chamber of Commerce and is sponsored by Heartland Regional Medical Center and the City of Marion. Doors open at 7:30 am for registration. Live2Lead begins at 8:30 am and concludes at 3:30 pm. Early Bird Tickets are on sale now through July 31! Tickets start at $65 per person (for members of Southern Illinois Chambers of Commerce) and can be purchased online through this online form or by downloading this form and mailing/delivering to the Marion Chamber of Commerce (2305 West Main, PO Box 307, Marion, IL 62959). Payment must accompany registration. No tickets will be sold after October 26. 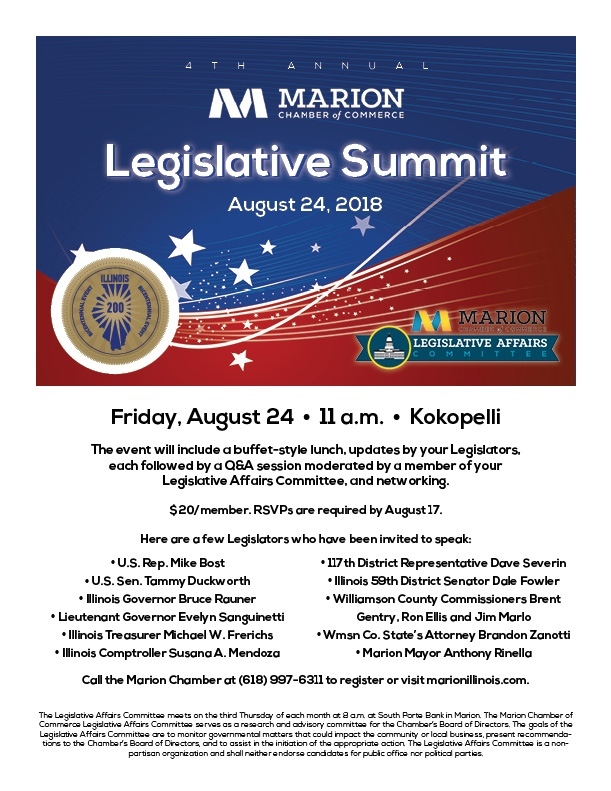 The 4th annual Marion Chamber of Commerce Legislative Summit will be held on Friday, August 24 at 11 a.m. at Kokopelli Clubhouse. The event will include a buffet-style lunch (served from 11-11:30 a.m. and includes lasagna, extra meat sauce on the side, Italian tossed salad, parmesan bread, chef’s selection of 3 desserts, tea, lemonade, water), updates by your Legislators (beginning at 11:30 a.m. sharp), each followed by a Q&A session moderated by a member of your Legislative Affairs Committee, and networking until 1:30 p.m. The registration fee for this event is $20 for members of the Marion Chamber ($25 for nonmembers), payable to the Marion Chamber of Commerce. Deadline to register is August 17. Registration required. If you are running for office and would like a table to interact with the Legislative Summit guests from 11-11:30 a.m. and after the program ends at 1 p.m. until 1:30 p.m., the fee is $150 for members of the Marion Chamber ($200 for nonmembers) and includes 2 lunches. There is limited space available! If you register for the event and are unable to attend, a 24-hour notice is required or you will be invoiced. Note: If you have registered and are unable to attend, you may transfer to a fellow employee without penalty. A refund will only be given to those with a paid registration who cancel more than 24 hours prior to the event. Click on the image below to RSVP. 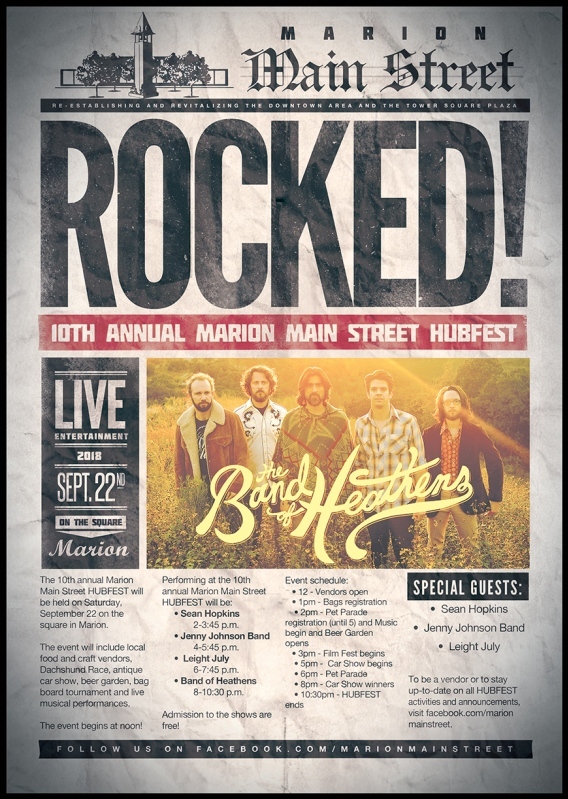 The 10th annual Marion Main Street HUBFEST will be held on Saturday, September 22 on the square in Marion. The event will include local food and craft vendors, Dachshund Race, antique car show, beer garden, bag board tournament and live musical performances. The event begins at noon. Admission to the shows are free! To be a vendor or to stay up-to-date on all HUBFEST activities and announcements, visit Facebook.com/marionmainstreet. Registration will be held from 11:30 a.m. to 12:30 p.m. Play will begin with a 1 p.m. shotgun start. Lunch is not included but Kokos bar will have burgers, hotdogs, and chips available for purchase. Register your four-person teams today! This event has always drawn a big turnout, and team slots will go fast! Individual golfers are $100 and a four-person team is $360. The event includes a "Lucky Umbrella" drawing (for an umbrella filled with lottery tickets), prizes, and more! Registration includes use of the range, green fees, golf cart rental, and a chance at great prizes and more! The drawing for the Million Dollar Hole-in-One shot will take place at 12:45 p.m. Every golfer from the first flight and all golfers from the afternoon flight who have registered by 12:30 p.m. will be entered in the drawing to take the shot. Sponsorships are also available. These, too, will go fast!